The pink-headed duck was no lucky duck. In 1948 a single specimen of this waterfowl,Rhodonessa caryophyllacea, was donated to the Division of Birds of the Smithsonian’s National Museum of Natural History. The following year was the last time anyone spotted one of its species—which lived in Bangladesh, Nepal, India and Myanmar—alive. Now, despite that it is likely extinct, new research has revealed this bird was a rare duck indeed. 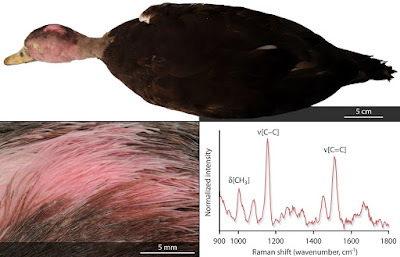 By shining lasers on the pink head feathers of the lone Smithsonian specimen and analyzing the spectral wavelengths of reflected light, Daniel Thomas of Massey University, New Zealand, and Smithsonian ornithologist Helen James determined it is one of only two species of waterfowl known to incorporate carotenoid pigments in its plumage. Carotenoids are of special interest to scientists because the evolutionary history of their appearance in bird plumage is unresolved. A paper on their study was published recently in the journal The Auk: Ornithological Advances, with Thomas as principle author. Carotenoid pigments originate in what a bird eats and many of the most vibrant feather colors (red, orange, yellow) are the result of carotenoids, James explains. “Some come straight into the plumage from the diet unmodified and some are modified physiologically by the bird before they go into the plumage.” Flamingoes, for example, get their pink color from the carotenoid pigments in the brine shrimp and blue-green algae they eat. In 2014 James and Thomas discovered carotenoid pigments, for the first time, in the plumage of a duck: Australia’s pink-eared duck (Malacorhynchus membranaceus). This bird has tiny pink ‘ear’ spots on each side of its head. “So, we were curious about the pink-headed duck,” James says. The two scientists then used Raman spectroscopy to study the pigments in the pink-headed duck’s feathers because it is a process that would not damage the Smithsonian’s lone specimen. Traditional methods for identifying pigments in feathers require plucking some feathers and destroying them. During the study Raman spectra were collected from the feathers of 20 other bird species in the Natural History Museum collections to provide a comparative dataset for studying the carotenoids found in the pink-eared and pink-headed duck. Raman analysis of both pink-headed and pink-eared duck plumage suggests that the pink plumage of both birds may be colored with the same type of carotenoid pigment.